The mood here changed drastically 2 days ago with new arrivals! Four students from Canada arrived and brought with them a lighthearted exuberance that we needed here. We loved our weeks of family time but it was becoming time to get some new blood here and get things rolling! 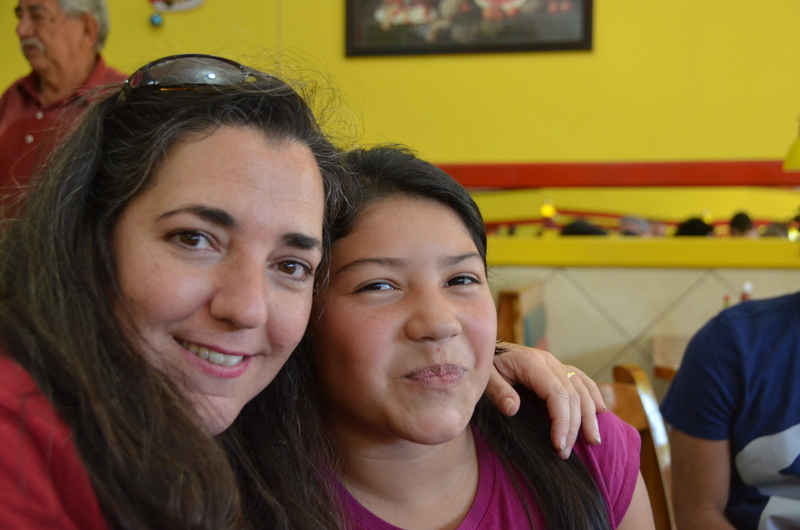 It is JD, Jazmin and Jessy’s first time visiting Guatemala…. for Rachel it is her second. She was with us last year for a few weeks and it is now a huge part of her life. Day one for them began with part one of ‘the tour’…. We had big plans yesterday…. 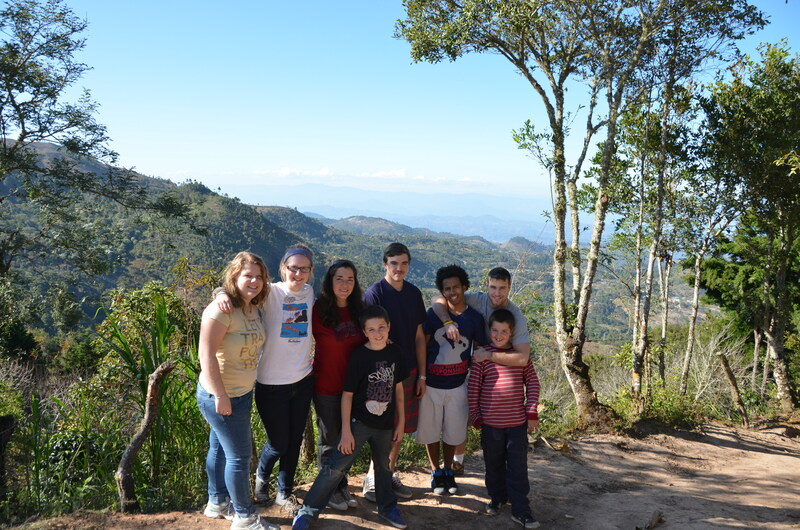 to visit sights, friends, and show our newest volunteers some of why we are here, beginning in Jalapa. 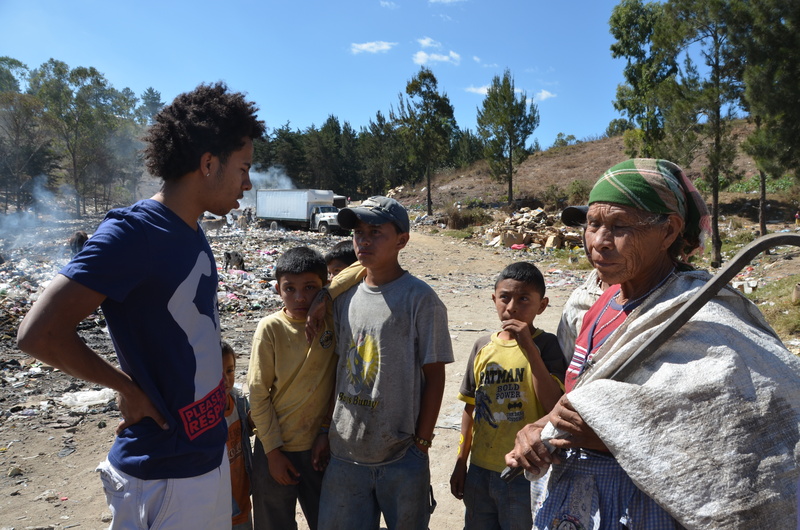 We started at the Jalapa dump. The dump is a place that is hard to believe when you first see it. It is a dump like any other city has…. one can even accept the pigs and cows that are left there by rich farmers to fatten them up…. what one cannot accept is the families living there. 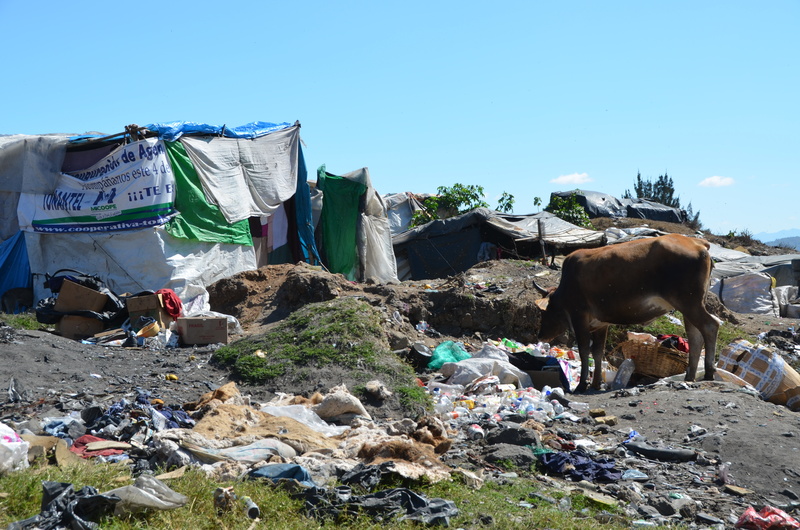 The laughter in the truck got quiet very quickly when these 4 realized that the structured mountains of garbage are actually makeshift shanties that people live in. 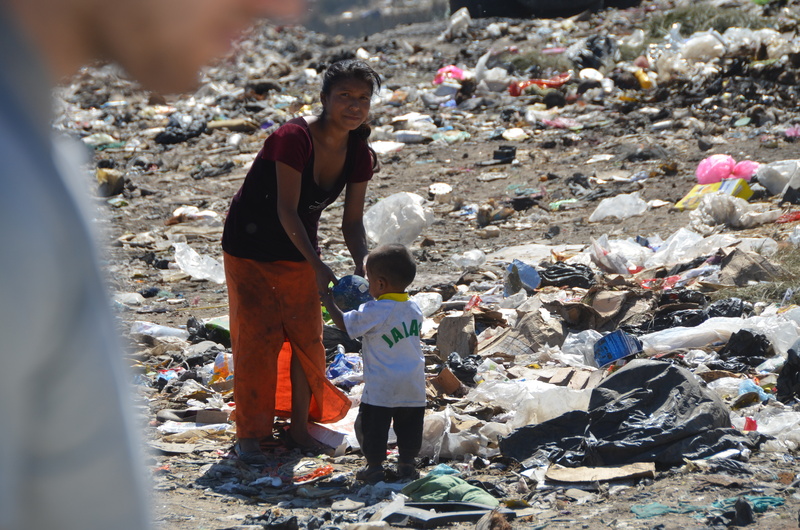 Kids and moms are everywhere sifting through garbage hoping to find a scrap of food or a treasure to sell. It is a place unlike anything I have ever seen in my life…. and I was rendered speechless and teary…. and I had been there several times. I can only imagine the thoughts running through our visitors brains upon seeing this horror for the first time. I remember the first time I went, I cried for days…. and it was an experience very formative to my decision to serve here. Having JD speak Spanish is a blessing. Our Spanish is improving and coming along nicely but communicating with the Mayan people is very difficult due to the speed and accent they speak with. He wandered around and talked with people… One woman told him she had been living there for 30 years…. 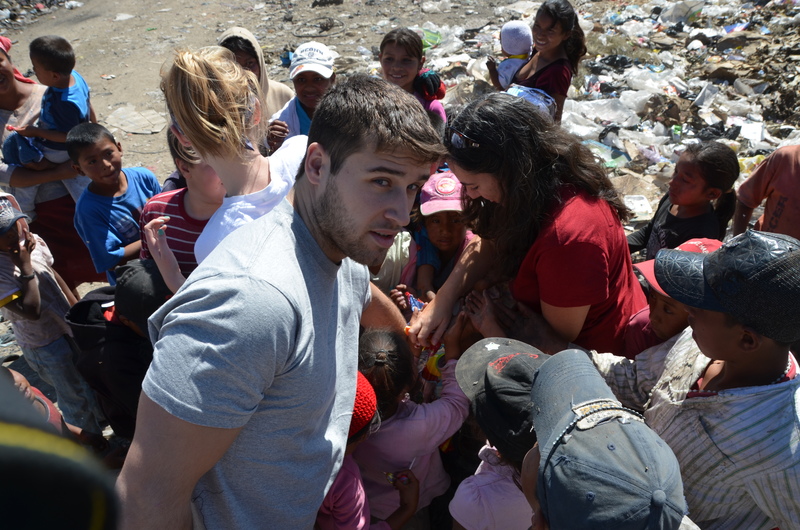 2 children told him their parents were killed and they had no where else to go…. So many people… so many stories… each one just as tragic as the last…. There are very few word I can write to do this place justice…. 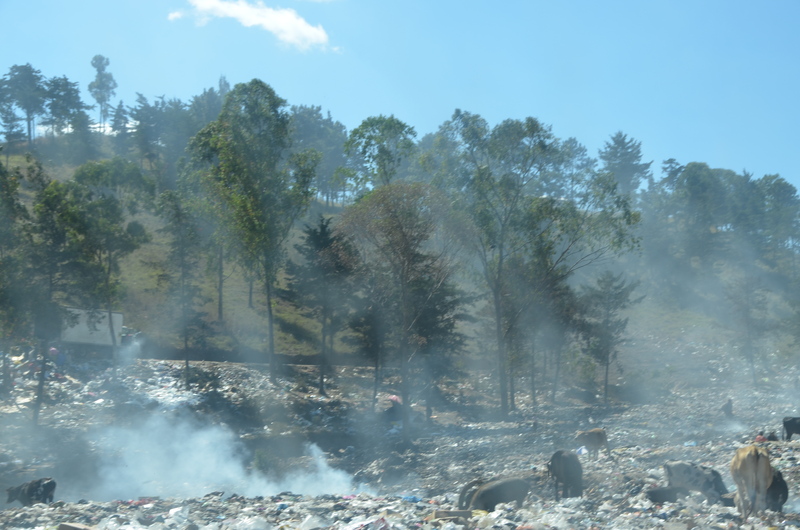 suffice it to say that with the people covered in filth, living with pigs and rats, eating literal garbage and perpetual fires burning that if there is a hell on earth, the Jalapa dump comes very close to being it. We handed out some candy, warm blankets, hats and warm clothing and left with promises to return soon with more provisions. 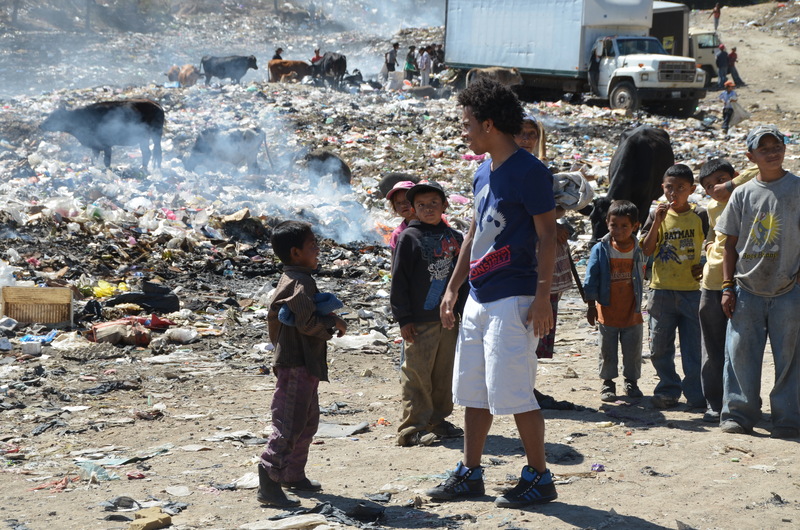 The ride out the gates of the dump was quiet with everyone thinking very hard of what they can do to help…. From there it was off to visit friends… Mynor, Vincenta and their family…. I wrote in a previous blog last year of their precious daughter Claudia. Our team last year pooled money together to buy her a mini laptop computer so she could continue her schooling and hopefully get a job to help her very poor family. We had many plans after visiting them…. but things change on a dime here….. I read once a few months back on a sign at a Church near our home in Beamsville…. “Coincidences are God’s way of being anonymous…”… I truly believe that. Especially after all the ‘coincidences’ we have experienced here, through the years in Guatemala. Well our visit with Mynor and his family was one of those ‘coincidences’…. We were going to visit them a few weeks ago but for one reason or another never got there…. so we decided that today was the day… no idea why…. just the way everything worked out. Well we got there and I heard a scream of delight from Claudia inside the door when she realized we were there. She threw herself into my arms and began to cry. I looked over at Vincenta and she was holding her youngest son Jose David who is just under 2 years old, and she was quietly sobbing. I let go of Claudia to hug Vincenta and she pulled violently away from me. At first I did not understand, but she quickly showed me her son. His arm was very severly burned and looked absolutely horrific. She was holding up his arm… and it was weeping blood and looked awful. Apparently he had pulled a pot of boiling water off the stove onto his arm on Monday…. they took him to the hospital but had no money to pay…. so the doctor cleaned the wound and sent them on their way. Since then she had just been holding him, keeping his arm up… fearing infection and with no idea what to do. It was a no brainer…. none of us needed to even talk about it…. we needed to help them. So we told them that we were taking them to the Clinic and getting Jose David fixed up and we were paying. She tearfully explained to JD that they had been praying for a miracle…. and then we knocked on the door…. The rest of our day was instantly planned for us…. there would be no more time for visiting our other friends or anything…. God had other plans for us this day. So off we all piled into the truck and went to the clinic. They took the little guy right away and so we waited. They gave him some medicine to make him sleep and they took care of his wound. 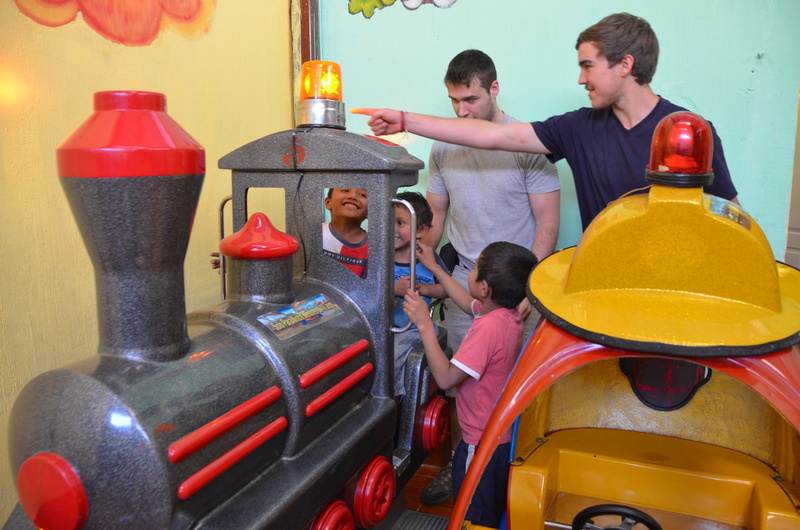 We took the others to a local restaurant for some lunch and played with the other boys in the play area. 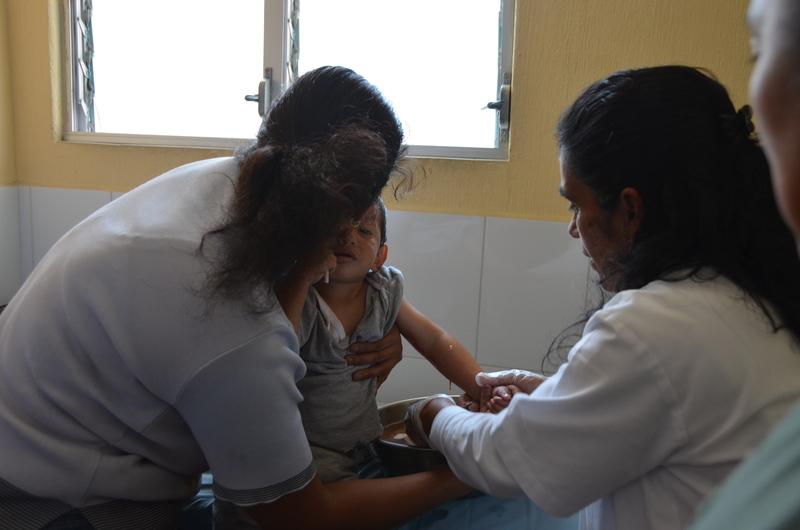 Vincenta and Jose David joined us when all was finished with his arm nicely wrapped and safely protected from infection. We paid the clinic for 3 more visits so that they can just take him every few days and get everything cleaned up and he can stay healthy. Together we ate… laughed and enjoyed the blessings of the day! It seems that every day we are here, we are reminded of why we are here…. that this is our reason for being born into a country that is so prosperous….. that this is our reason for fundraising money for Guatemala…..I am reminded of what Hermana Mercedes said to us just before Christmas through her tears that “We were all born to serve the poor”…. My prayer, and I hope your’s is that these young people that are here volunteering are touched… that everyone who visits here, or anywhere in the world that has need, are touched…. 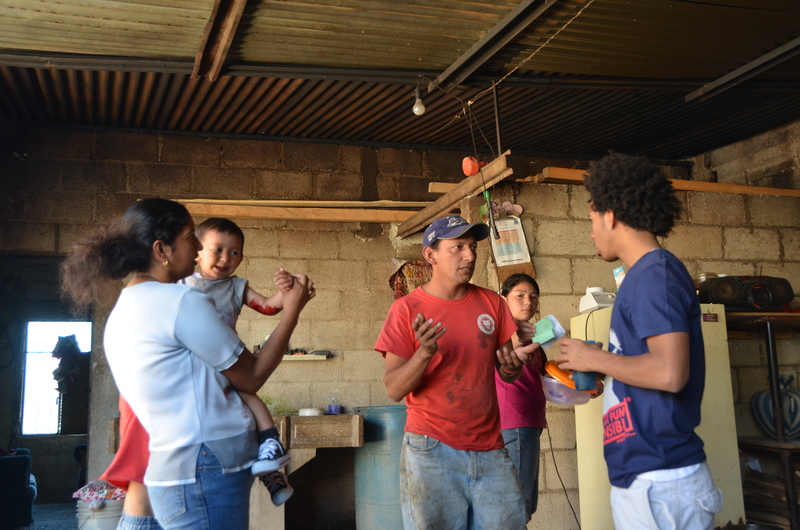 and that they spread the word… and one family by one family, together we can change the world…. 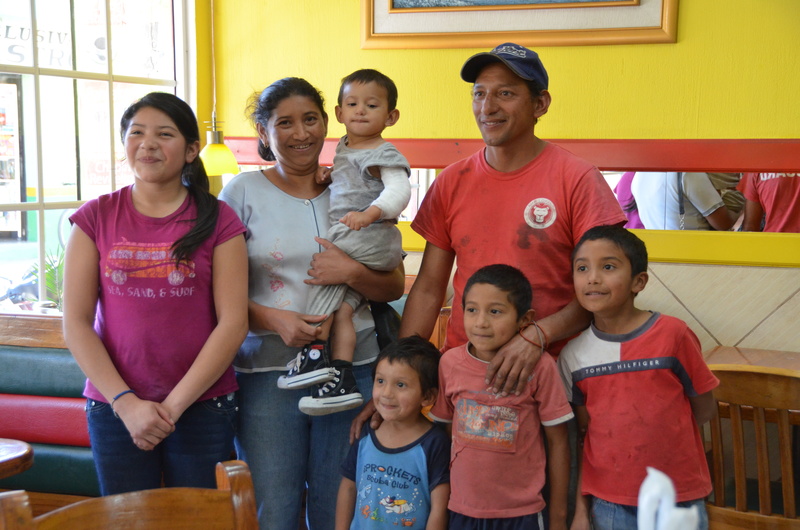 Posted on December 30, 2011, in Guatemala Missionary, Uncategorized and tagged celebrate life, Guatemala, Malnutrition, mission, Missionary, Volunteers, World Impact, Youth. Bookmark the permalink. 2 Comments. Wow Rita…this brings tears to my eyes. What a touching story. God is good. Praying for you all. Wonderful to read how you are serving our Heavenly Father! We are sharing our home with a baby girl, Mya, right now.